The X-420™ is a fully-featured, Ethernet I/O monitoring and data acquisition module with an innovative solution for creating advance logic (tasks) without the need for scripting. 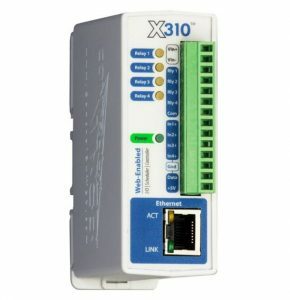 Monitor and log up to 100 inputs and/or outputs from up to 32 remote I/O modules using the X-420’s intuitive web interface. 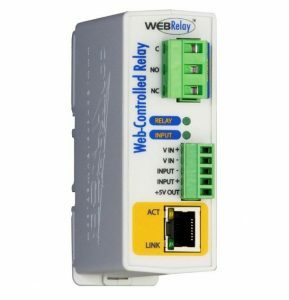 Push sensor data to other ControlByWeb modules. No software required, no programming necessary, and no subscription to buy. 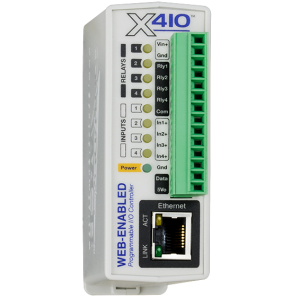 The X-410 has a built-in web server so it can be set up, controlled, and monitored using a standard web browser (or by using our smartphone app). Configurable for single-ended, differential or 4-20mA (0-20mA) input operation. Monitor industrial sensors, wind direction sensors, pyranometers, pressure transducers, and much more. Monitor up to 16, 1-Wire sensors such as: Temperature and humidity sensors. Inputs: Monitor dry contacts including push buttons, magnetic door alarm switches, micro-switches, etc. Outputs: Provides a digital logic signal which can be connected to a solid-state relay to control motors, pumps, lights, etc. Monitor a frequency input such as: Magnetic wind speed sensor, transformer, etc. 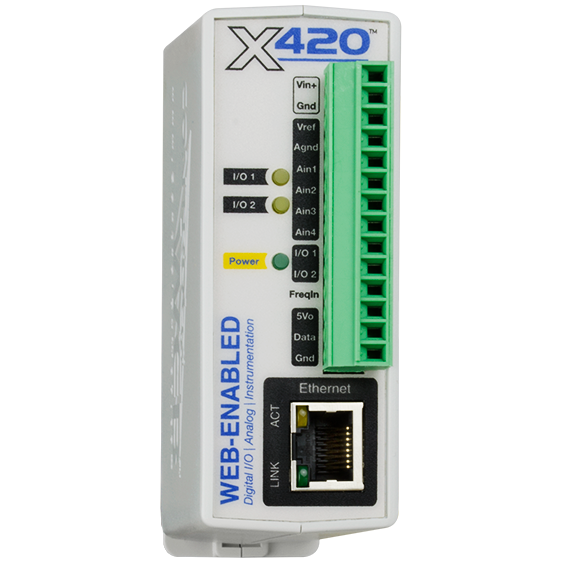 The X-420 supports peer-to-peer communication between ControlByWeb modules. It communicates with up to 32 modules and allows you to monitor and control up to 100 I/O points. 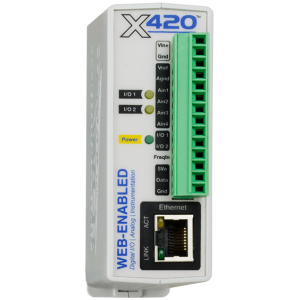 The X-420 can communicate with all ControlByWeb devices* but offers instantaneous messaging between X-400 Series products, this means that the X-420 can monitor and control I/O on other X-400 Series products as if it was directly connected to the module. The X-420’s built-in interface allows you to create custom “Tasks” for simple and advanced control logic. Easily create tasks based on inputs or outputs’ status. Create up to three actions for each task providing you with the ultimate control and monitoring solution for your application! Create up to 50 Scheduled, 50 Conditional, and 20 Override Schedules.